BULLS GAP, Tenn. — The Schaeffer’s Oil Spring Nationals Series presented by Sunoco Race Fuels and Tennessee RV Supercenter $10,052-to-win fifth annual Scott Sexton Memorial is scheduled FRIDAY, APRIL 28 at Volunteer Speedway. The Scott Sexton Memorial (52 laps … $10,052-to-win) Spring Nationals Series event for Super Late Models will headline the racing program, which will feature time trials, heat races and last chance consolation races. There will also be Crate Late Model (30 laps … $1,500-to-win), Sportsman Late Model (25 laps … $800-to-win), and Modified Street (25 laps … $700-to-win) action on the high banks. The grandstand and pit gates will open FRIDAY, APRIL 28 at 1 p.m. The drivers’ meeting is scheduled for 7 p.m., with hot laps tentatively starting at 7:15 p.m., to be followed by qualifying and green flag racing beginning a little after 8 p.m. Adult grandstand admission $25, with kids 12-and-under admitted free (with paying adult). … Adult pit admission $40, with kids 12-and-under admitted for $15 (with signed adult release). 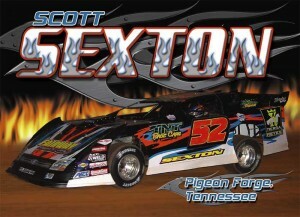 The Scott Sexton Memorial is held in memory of the late Scott Sexton, from Pigeon Forge, a two-time (1991 and 1995) Volunteer Speedway champion who passed away on January 10, 2013 after battling health issues for seven years. 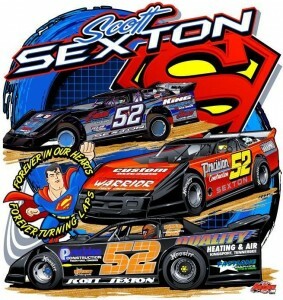 Sexton left his mark in East Tennessee racing history during a distinguished 30-year racing career in go-karts (over 300 wins) and dirt late models (164 wins), which saw him earn the nickname “Superman” from his fans. Sexton scored the biggest victory of his career in 1992 at Volunteer Speedway, as he defeated a stellar field of the nation’s top dirt late model drivers in winning the Mello-Yello 100 for a payday of $12,500. Other big victories during his career include the Rusty Wallace Pontiac 100, Banquet Table Buffet 100, Action Attraction Photos 100, Dalton Direct Carpets 100, Lance Cunningham Ford 100, American Freedom 100 and East Boulevard Motors Shootout 100, all at the “World’s Fastest Dirt Track” – Volunteer Speedway. … Sexton also won an American Late Model Series (Johnny Appleseed Classic) event at the famed Eldora Speedway in Rossburg, Ohio, along with 10 Southern All-Star Racing Series sanctioned races. Past winners of the Scott Sexton Memorial include: Chris Madden of Gaffney, S.C. (2013), Brad Neat of Dunnville, Ky. (2014), Ray Cook of Brasstown, N.C. (2015), and Ricky Weiss of Headingly, Manitoba, Canada (2016). Top 10 drivers in Schaeffer’s Oil Spring Nationals Series presented by Sunoco Race Fuels and Tennessee RV Supercenter points entering the Scott Sexton Memorial at Volunteer Speedway on FRIDAY, APRIL 28: 1. Brandon Overton of Evans, Ga., 2. Donald McIntosh of Dawsonville, Ga., 3. Michael Chilton of Salvisa, Ky., 4. Shanon Buckingham of Morristown, Tenn.; 5. Ricky Weiss of Headingly, Manitoba, Canada; 6. Robby Moses of Maryville, Tenn.; 7. Mike Marlar of Winfield, Tenn.; 8. Jason Croft of Woodstock, Ga.; 9. Dale McDowell of Chickamauga, Ga.; 10. (tie) Michael Page of Douglasville, Ga., 10. (tie) Casey Roberts of Toccoa, Ga.
Also, expect to see Jimmy Owens of Newport, Tenn.; Brandon Sheppard of New Berlin, Ill., Chris Madden of Gaffney, S.C.; Steve Casebolt of Richmond, Ind. ; Devin Moran of Dresden, Ohio; Jackie Boggs of Grayson, Ky.; Tyler Erb of New Waverly, Texas; Joey Coulter of Concord, N.C.; Austin Horton of Whitesburg, Ga.; Zach Dohm of Cross Lanes, W.Va.; Carder Miller of Salem, Va. – along with East Tennessee chauffeurs Vic Hill of Mosheim, Riley Hickman of Cleveland, Chad Ogle of Sevierville, Billy Ogle Jr. of Knoxville, Ryan King of Seymour, Mark Douglas of Knoxville, Tommy Kerr of Maryville, Steve Smith of Powell, Stacy Boles of Clinton, Levi Ashby of Cumberland Furnace, and possibly others. * It is MANDATORY that ALL race cars are equipped with a window net and drivers must use driving gloves, per Volunteer Speedway safety rules. ** The entry fee is $100 at all Spring Nationals Series events plus transponder rental that will be used to time and score the cars (per series rules). The tire rule for the Volunteer Speedway event will be as follows: Hoosier- 1350, 1600 – American Racer 48, 56. Tires will also be checked for soaking and by durometer for hardness before each car goes on the track for qualifying or any racing action. *** The car and driver weight rules for this event will be as follows: 2350 lbs. for an Open Motor, 2300 lbs. for a Steel Block/Aluminum Head – Spec Motor Only (8″ spoiler allowed, 12″ sides), 2250 lbs. for a CT525 Motor (8″ spoiler allowed) and 2250 lbs. for an all Steel Motor or Crate Motor (8″ spoiler allowed, 12″ sides). There will be a pound per lap burnoff plus 5 lbs. in Heats, Last Chance races and in the Feature. *** NOTE: There will be no reserved seating for the Scott Sexton Memorial, all seating general admission (but there’s not a bad seat in the house). With a large crowd expected and all available seating space needed for the Scott Sexton Memorial, no lawn chairs will be permitted in the grandstands. Only stadium seat-type cushions will be allowed. Also, no coolers or outside food allowed to be brought into the front straightaway (main) grandstands!!! Coolers are permitted in the pit area and the backstretch tier-parking, however, no glass containers allowed. Camping is available on the track property, however, with no hookups. For those camping, once you enter through the main gates, drive over to your right and set-up in the designated area. Directions to Volunteer Speedway: South on Interstate 81 from Tennessee/Virginia state lines, take Exit 23 (Bulls Gap/Greeneville), then turn right onto Hwy. 11-E at bottom of the exit ramp. Look for track entrance approximately 200 yards on left. North on Interstate 81 from I-81/I-40 split (East of Knoxville, TN), take Exit 23, then turn left onto Hwy. 11-E at bottom of the exit ramp. Continue underneath the interstate over-pass and track entrance approximately 300 yards ahead on left.